Working Together Southern York County Pantry is a non-profit organization overseen by a Board of Directors and supported by local community churches, located in Southern York County. ALL donations go to serve our community. Many of the families who come to us are working but do not make enough to keep food on their table. We see our highest number of families requesting food assistance during the holidays. 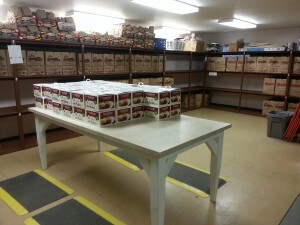 The Southern York County (SYC) Pantry was begun in 1982 as a social justice program. It is totally a volunteer non-profit organization. The Pantry serves the communities of the Southern York County with food and/or energy assistance. The Pantry is hosted by St. John The Baptist Church and is housed in the outreach building pictured above. The Pantry is supported many local churches to continue it’s Pantry’s mission. The Churches, and individual members donate food and money, recruit volunteers, and send representatives to meetings. We continue to receive generous support from many local business, organizations and individuals. Our pantry is unique in our area in that we are the only pantry to deliver food seven days a week. There are typically more than 80-100 families each month who use our services and it seems our numbers grow each year. Many of the families who come to us are working but do not make enough to keep food on their table.